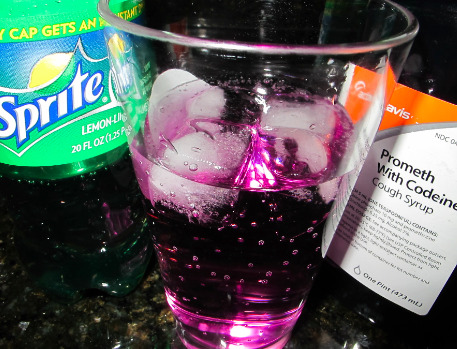 Codeine and Promethazine-Curious About What Drank Does Or Make You Feel Like On Lean? Can You Really Become Addicted To Drank? 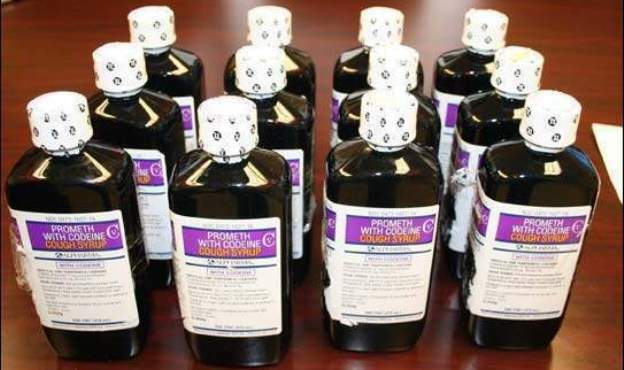 Sippin on syrup, lean, purple drank – whatever you call it, drinking codeine and promethazine containing cough syrup will get you high, but it’s also dangerous and since codeine is a narcotic, it’s pretty addictive. Addictive enough, in fact, that if you sip enough of that syrup, you could end up going through a heroin withdrawal like period of detox. Made famous through southern screwed and chopped hip hop music, and centralized out of Houston, syrup killed rap artist Pimp C last year, and Lil Wayne has admitted to a serious addiction to the drug. Sippin syrup will get you feeling pretty good. Codeine is an opiate, similar to other notable opiates like heroin, morphine,percocet, oxycontin or vicodin. Codeine happens to work well as a cough suppressant, but like all other opiates, it also works to control pain, and notably, to make you feel very good. Codeine, when taken in larger than recommended doses will create feelings of contentment, euphoria, relaxation, sleepiness and well being. Promethazine is an antihistamine, and also a CNS depressant. Promethazine works to increase the potency of the codeine. Promethazine mixed with codeine gets you higher. Users generally mix a small amount of the cough syrup together with sprite, soda or fruit juice, and often a hard candy like a jolly rancher as well. The drink is slowly sipped leading to a sense of contentment, and well being. In larger doses, euphoria and un-coordination can result. The drink is sometimes called lean because of the way people on syrup tend to walk. Other narcotic pain medications, such as hydrocodone, tramadol, morphine, fentanyl, methadone, heroin and many others. Any medications that warn of drowsiness or sleepiness. Certain brands of prescription cough suppressant work through two active medicinal ingredients – codeine and promethazine. Codeine, like all opiates, is very addictive, both psychologically, and physically. If you use codeine and promethazine cough syrup for a couple of weeks, every day, you will become physically dependent on the drug. If you become physically dependent on the drug, you will need to take it every day, or more than once a day, just to keep the sickness of codeine withdrawal and detox at bay. Although codeine is not as potent or addictive as heroin, the addiction and withdrawal symptoms share many similarities to a heroin addiction and withdrawal. If you abuse codeine and promethazine cough syrup too regularly, you will get addicted, and getting addicted to opiates is no fun at all. In large doses, you can die. If you take it recreationally with certain other medications, you also risk an overdose. If you use it recreationally, and you suffer from certain medical conditions, you could suffer a fatal overdose. Opiates are central nervous system depressants. Promethazine is also a central nervous system depressant. They both slow you down, which is part of why people enjoy taking the drugs, but also why they can be quite dangerous. These medications will slow down your breathing. If you take them in high enough doses, your breathing can slow down so much that you die from it. If you take these medications with other CNS depressant medications (like other prescription pain killers, alcohol, certain anti depressants etc.) the addictive and cumulative effects of the medications can result in an overdose. And an overdose can result in death. Abusing codeine and promethazine recreationally is dangerous, but abusing it recreationally while taking other medications is very risky. Pimp C died in his sleep after taking codeine and promethazine. He had sleep apnea which interfered with his breathing, and when combined with the respiratory depressive effects of the medication, killed him. Regular users of the drug will develop a tolerance and need to take ever greater doses to get high. As you take greater doses of the CNS depressing medication, your risk of overdose increases. If you play for too long with codeine and promethazine, you will pay the price of a very uncomfortable detox and withdrawal period when you try to stop. Withdrawal pains will last from a few days to a week, and can be very tough to overcome without some help. Cough syrup doesn’t seem as scary or serious as heroin or even oxycontin but the withdrawal period is rough, and you will probably need some help to get off. Get into an opiate substitution program – like methadone or Suboxone. A cold turkey detox is fastest, but toughest. Weaning yourself off the medication can work, and if you have the discipline, and are in no real rush, can be a reasonably effective way to get off the drug. The key to weaning down off of codeine and promethazine is not to hurry. Try going down by 10-20%. Reduce your daily dosage by 10-20% and wait until that feels ok before attempting to again reduce the dosage. A good tip is to have a trusted friend or family member control your access to the medication, to ensure that you actually stay on course with your daily dosage reductions. Have a friend (preferably a sober friend) mix the drinks for a while. The last option is to participate in an opiate substitution program, like methadone or suboxone (buprenorphine). These are medications that you take instead of the cough syrup. They will keep you from feeling sick, but will not get you high. You will gradually need to reduce your dosage off of these medications. Opiates are fun. They feel good and they are seductive, and it’s so easy to get sucked into an addiction. It doesn’t take long at all, and before you know it – you’re a junky, and once you are, getting off is tough. If you’re not yet addicted, make sure you stay that way. If you plan on continuing to use codeine and promethazine recreationally, make sure you don’t get high every day. The more often you get high, the greater your risk of addiction. If you’re thinking about experimenting with a little purple drank – wondering what all the fuss is about – make sure you understand the risks, and think hard about whether or not it’s worth it. Robert Earl “DJ Screw” Davis, Jr. (July 20, 1971 – November 16, 2000) was a Houston, Texas-based DJ. He was known as a central figure in the Houston hip-hop community and was the creator of the now-famous Chopped and Screwed DJ technique. This creation led to his nickname of “The Originator.” Davis was recognized for his various mixtapes and albums mostly on a regional level, until after his death. His legacy was discovered by a wider audience when Houston hip-hop began reaching a national audience in 2005. DJ Screw was born in Bastrop, Texas, not far from Smithville, Texas. His father, Robert Earl Davis, Sr., was a long-haul truck driver based in Screwston. His mother Ida May Davis (who had a young daughter from a previous marriage), came to the area to be with her mother when her son was born in 1971. She returned to Screwston, but the marriage was floundering; soon it would be over, and she and her kids moved to Los Angeles for a couple of years, then back to Screwston, and returned to Smithville in 1980 at the age of nine. A young DJ Screw had aspirations of being a truck driver like his father, but seeing the 1984 hit break dancing movie Breakin’ and discovering his mother’s turntable permanently derailed those dreams. He would take her B. B. King and Johnnie Taylor records and scratch them on the turntable the way deejays did, slowing the spinning disc and then allowing it to speed back up, playing with sound. Robert Earl began buying records of his own and playing deejay with his distant friend Trey Adkins, who would rap. “Screw had a jam box,” Adkins told Texas Monthly, “and he hooked up two turntables to it and made a fader out of the radio tuner so he could deejay.” Adkins said if Robert Earl didn’t like a record, he would deface it with a screw. One day Adkins asked him, “Who do you think you are, DJ Screw?” Robert Earl liked the sound of that and in turn gave his long time friend a new name: Shorty Mac. He began DJing at age 12 in 1983, and started his trademark slowed-down mixes in 1990. The mixes began as special compilations requested by friends and those in the know. He soon made them available for sale when his close friend Toe offered to buy a mix from him for ten dollars. At that point, customers had increasingly begun requesting his more well-known mixes instead of personalized lists. During the early 1990s, he invited some of the Houston rappers from the city’s south side to rap on those mixes. This coalition of rappers eventually became the formation of the Screwed Up Click. He moved to a house near Gulfgate Mall. Fans, some driving from far away areas such as Dallas and Waco, lined up at his door to obtain his recordings. He started his own business and opened a shop up on 7717 Cullen Blvd in Houston TX called Screwed Up Records and Tapes. It has been shown in numerous music videos and documentaries as well as independent films. There are now several Screwed Up Records and Tapes spread out through Texas, including one in Beaumont and in Austin. Texas Governor Rick Perry honored him by making him an official Texas Music Pioneer. Davis died on November 16, 2000. Fans speculated about the true cause of his death. When the coroner reports were released, they confirmed that he died of a codeine overdose in addition to mixed drug intoxication. The codeine came from a prescription-strength cough syrup that he would mix with soda to concoct a beverage called purple drank. In addition to codeine, Valium and PCP were found in his blood. His funeral took place at Mount Pilgrim Baptist Church in his hometown of Smithville, Texas. DJ Screw has been a considerable influence in the Houston scene, which is sometimes referred to as “Screwston” in his memory. His distinct musical stylings influenced countless rap acts. Alternative weekly The Houston Press named the 1995 album 3 N’ Da Mornin, Part 2 as no. 13 on its list of the 25 best Houston rap albums of all time. The newspaper credited the release for the way it helped shape Houston’s hip-hop culture. The newspaper also referred to Chopped and Screwed music as the second most likely type of music to be associated with Texas, an example of DJ Screw’s influence in the region. A music festival and car show in honor of DJ Screw was set up in 2006. The inaugural DJ Screwfest featured 200 vehicles  and a setlist featuring notable Houston hip-hop acts like Slim Thug, Trae, and Chingo Bling. The first festival, which took place at the Pasadena County Fairgrounds, ran into problems including rain and limited sound equipment. When the Houston hip-hop scene became nationally prominent in 2004, many of the biggest acts could be traced to DJ Screw’s crew, the Screwed Up Click. The expansive crew, which featured more than 15 rappers, were featured prominently on his mixtapes and often spent nights with him recording. Some of the more famous rappers to come out of the Screwed Up Click include Big Hawk, Lil’ Keke, and Fat Pat. While many of the S.U.C. rappers enjoyed major-label success, DJ Screw himself remained largely underground. He was uncomfortable with mainstream business practices like bank accounts and copyrights. He would allow members of the S.U.C. to rap on his mixtapes free of charge, despite the large amount of exposure a screw tape feature could provide. A single tape could have reached 100,000 listeners according to some estimates; they often led to further success, including recording contracts. **There Is No Disrespect or any misleading incorrect content placed on this site Intended Towards Dj Screw or anyone from Houston,Texas. I appreciate everything Dj Screw brought to myself and the Kandy Paint Records Family. There will be more articles,blogs and content in reference to DJ SCREW! Stay TUNED!